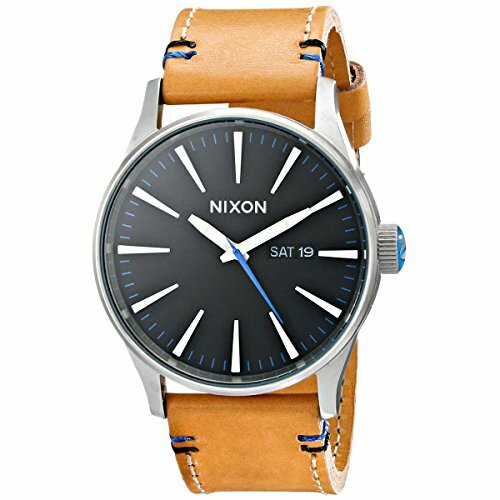 I personally own a Leather Sentry watch just like this one, and I love it. Looks great with anything, bold but no too big, and very comfortable. Stainless steel case with a tan leather strap. Fixed stainless steel bezel. Black dial with luminous hands and index hour markers. Minute markers around the outer rim. Dial Type: Analog. Luminescent hands and markers. Day of the week and date display at the 3 o'clock position. Quartz movement. Scratch resistant mineral crystal. Solid case back. Case diameter: 42 mm. Case thickness: 12 mm. Round case shape. Band width: 22 mm. Tang clasp. Water resistant at 100 meters / 330 feet. Functions: date, day, hour, minute, second. Casual watch style. 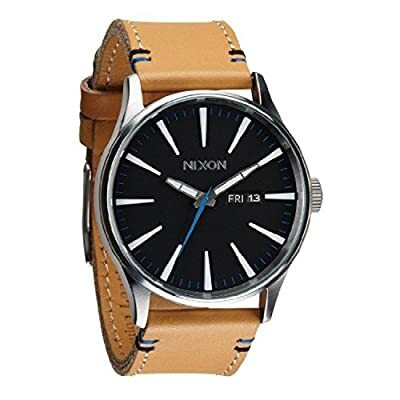 Nixon Sentry Black Dial Tan Leather Mens Watch A1051602.